Al-Tannoura Egyptian Heritage Dance Troupe is an architecturally stunning arts centre in El Azhar area in Central Cairo, operating under the Ministry of Culture and the Cultural Development Fund (CDF). 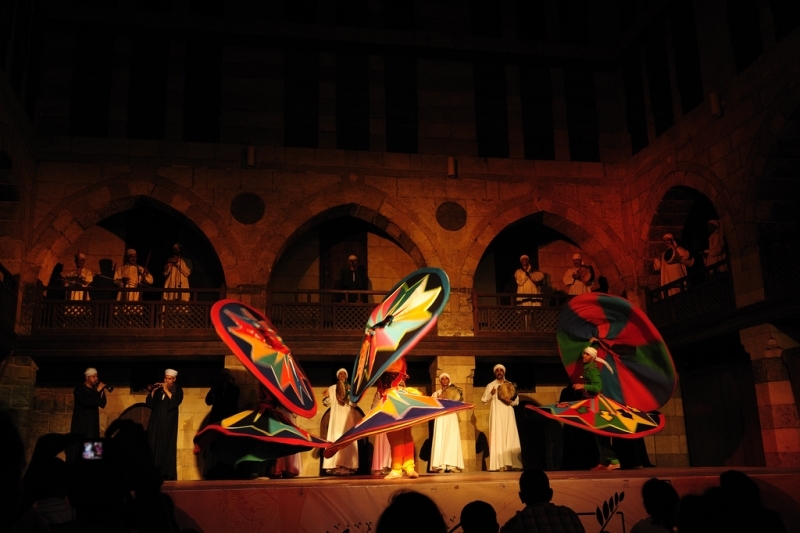 Since finalizing restorations to the Wekalet in October 2005, it has become a hot-spot for organizing cultural events; the most popular being the bi-weekly El Tannoura dance performance. 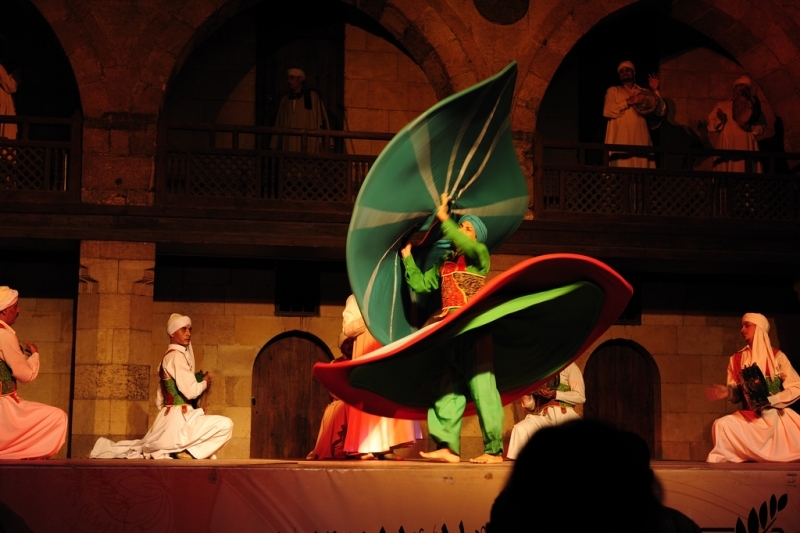 The performance is similar to the more commonly known whirling dervishes; however this version of the indigenous dance incorporates instruments and other additional elements. Beit El Harrawy, Beit El Sehaimy and El Ghouri Palace. Each brings a variety of cultural activities and events to the area. 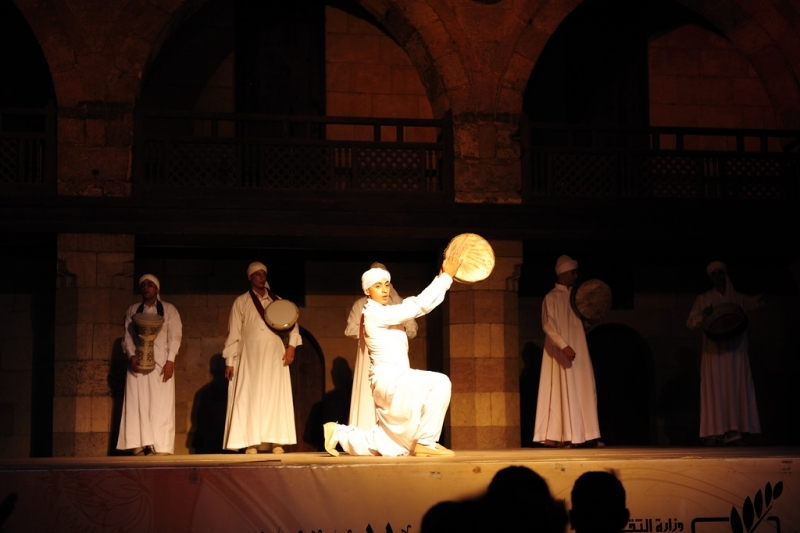 We chose to visit El Ghouri Palace, to watch Al-Tannoura Egyptian Heritage Dance Troupe. The original center was built in 1504 A. D by sultan Qunsuwah El Ghouri. During the Mamluk era, the wekalet Sultan El Ghouri was one of several trade points, known at the time as ‘wekala’ a place where merchants gathered for trade, and also served as a residence for the merchants and their families. In August 2005, plans on how to develop the building into a cultural center were being considered. At that time there were already three other art centers in the same zone of historic Cairo. The then-director of the place wanted to think of a way to find harmony between the history and the people who live in the area, so El Tannoura performance was a good choice for the center. 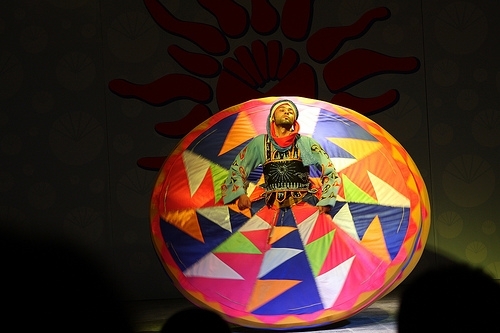 There are also other kinds of performances at the wekala such as international folk art performance and visiting Arab singers and musicians. After arriving in the bustling area surrounding Khan El Khalili, we set about finding the Wekalet El Ghouri Center. We entered an area filled with merchants selling copper and other handcrafts, and in the hub of this area, we found the Center, easily recognizable by its beautiful architecture, as well as the queues of people awaiting the start of the show.The security at the building informed us that the show would start at 8:30 pm, and we instinctively inquired about fees or donations, but were confidently informed that the performance was free of charge. They added, ‘First of all, this is the policy of the Cultural Development Fund. Second, we have to think about the ticket culture. This might be the culture of an Opera House, but not of the people here in the neighbourhood. People here don’t like formal attire and the closed-door attitude, we have to always be welcoming. We also learned that most of the funding comes from either renting the place out for special events or from the gift shop. The centre targets the local residents, but for El Tannoura shows, about 60% of the audience is tourists. While we sat with the audience, a group of performers appeared with an array of instruments ranging from the Daf (tambourine) to the Oud and Ney (flute). After a few solos by various singers, a vocalist appeared on a balcony. This specific vocalist, officially known as the Muezzin, sings of spirituality. 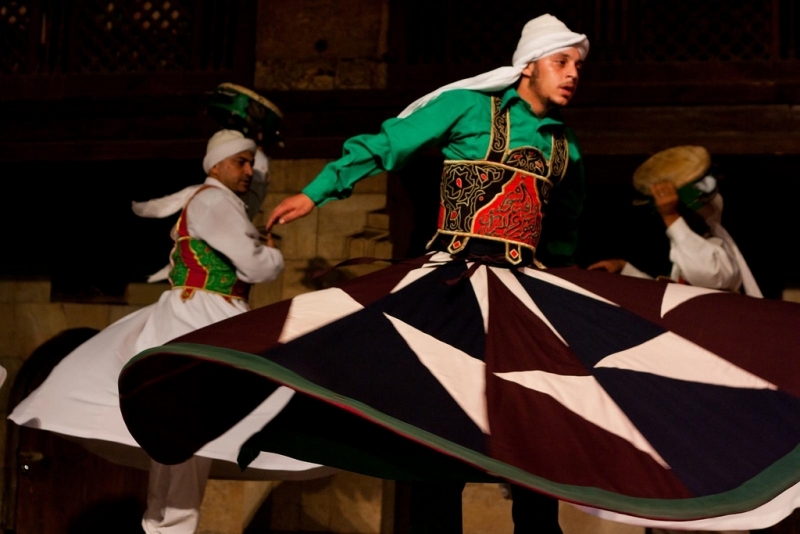 The second part of the performance, the Sufi Tannoura Dance (El Darawish) is derived from the dance performed as part of a Sufi ritual. The third part of the performance incorporates a more spectacular dance, more based on the showing of skills and costume design. 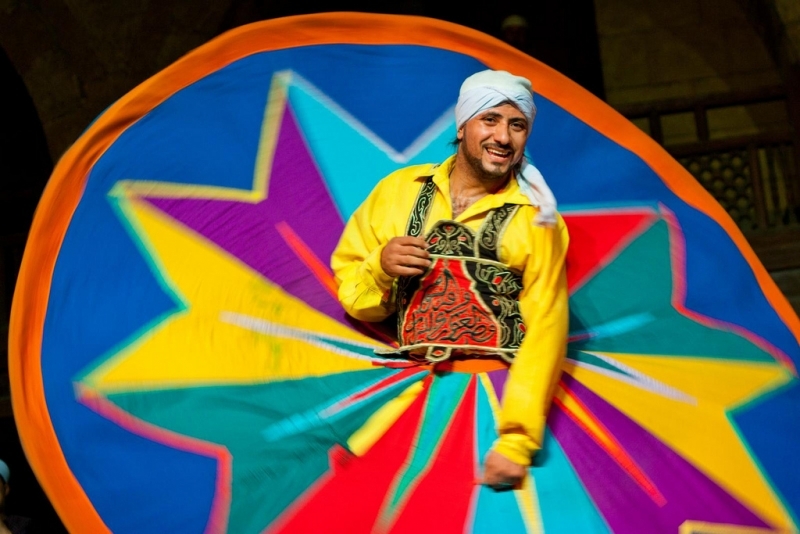 Egyptians developed the Sufi whirling dance to create a show not quite related to spirituality, where the performers have added colorful costumes and rhythmic tones to the music, incorporating Egyptian folk traditions to the religious spiritual aspect. In Sufi dancing. The dancer must be spinning in a certain direction related to the direction of the sun. One hand must be pointed to the sky and the other toward the earth, which symbolizes establishing a connection between the two. The circular movements of the dancer represent the ridding of worldly burdens, until he reaches ecstasy through this attempt to reach heaven. 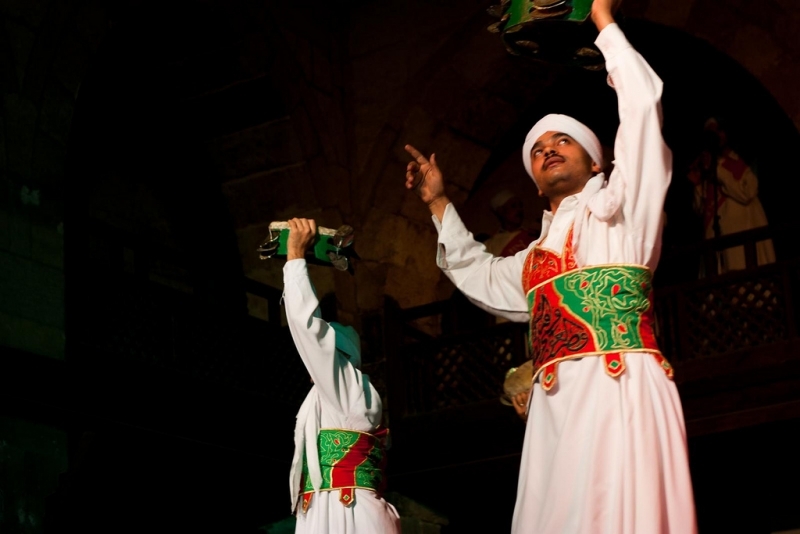 The untying of the belt around the waist towards the end of the dance represents the beginning of his journey to heaven.The performer we personally found most memorable was the principal dancer of the Sufi Tannoura Dance who, encouraged by a troupe of musicians, seemed to enter into a trance. He appeared to reach a level of ecstasy while on stage, possibly due to the dance functioning as an intermediary between him and God. Overall, the dance is full of Sufi symbolism, and having some background knowledge cam make the viewing of the performance more interesting. How much is a Camel Worth in Egypt?! Where is King Tut now?